Do not keep turning your pork; grill three to four minutes per side on the leftmost side of grill. The idea is to gently “caramelize” the outer portion before turning. As you cook from left to right, turn your meat more often. Keep a close eye on it. 1. 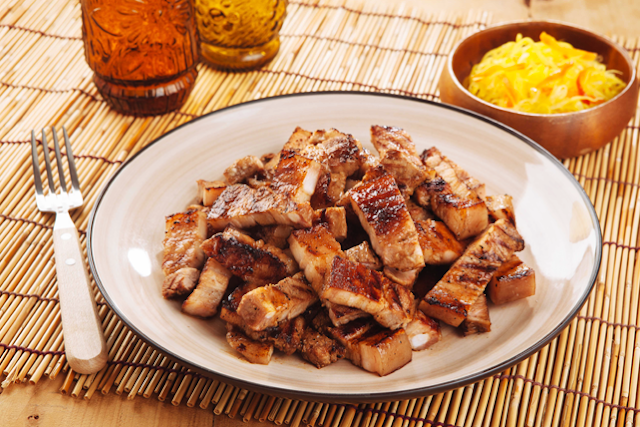 Marinate pork with white soda, MAGGI MAGIC SARAP®, garlic, MAGGI ® SAVOR, pepper and chili for 4 hours or overnight in the refrigerator. 2. Remove from the refrigerator 1 hour before grilling. Preheat a clean grill and brush lightly with oil. Grill pork 3-4 minutes per side over medium high heat. 3. Remove from the grill and set aside to rest for 10 minutes. 4. Cut into bite-size pieces, transfer into a serving plate and serve.